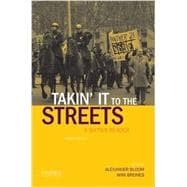 The fourth edition of Takin' it to the streets revises the comprehensive collection of primary documents from the 1960s that has become the leading reader about the era. Adopted nationwide, this anthology brings together representative writings, many of which had been unavailable for years or had never been reprinted. Drawn from mainstream sources, little-known sixties periodicals, pamphlets, public speeches, and personal voices, the selections range from the Port Huron Statement and the NOW Bill of Rights to speeches by Malcolm X, Richard Nixon, Robert Kennedy, and Ronald Reagan, to private letters from civil rights workers and Vietnam soldiers. Introductions and headnotes by the editors highlight the importance of particular documents, relating them to each other and placing them within the broader context of the decade. The book focuses on civil rights, Black Power, the counterculture, the women's movement, anti-war activity, gay and lesbian struggles, and the conservative current that ran counter to more typical sixties movements. These include both topics that fell outside the daily attention of the media and those that made front-page news. Covering an extremely popular period of history, Takin' it to the streets remains the most accessible and authoritative reader of an extraordinary decade, one unlike any America had seen before or has experienced since. Alexander Bloom is Professor of History and American Studies at Wheaton College. He is the author of several books, including Long Time Gone: Sixties America Then and Now (OUP, 2001) and Prodigal Sons: The New York Intellectuals and Their World (OUP, 1987).